A heat exchanger is a device built for efficient heat transfer from one medium to another. They are widely used in space heating, refrigeration, air conditioning, power plants, chemical plants, petrochemical plants, petroleum refineries and natural gas processing. One common example of a heat exchanger is the radiator in a care, in which the heat source, being a hot engine-cooling fluid, water, transfers heat to ait flowing through the radiator. A shell and tube heat exchanger is a class of heat exchanger designs. It is the most common type of heat exchanger in oil refineries and other large chemical processes and is suited for higher pressure applications. As the name implies, this type of heat exchanger consists of a shell (a large pressure vessel) with a bundle of tubes inside it. One fluid runs through the tubes and another fluid flows over the tubes (through the shell) to transfer heat between the two fluids. The set of tubes is called a tube bundle and may be composed by several types of tubes like plain, longitudinally finned etc. Two fluids, of different starting temperatures, flow through the heat exchanger. One flows through the tubes (the tube side) and the other flows outside the tubes but inside the shell (the shell side). Heat is transferred from one fluid to the other through the tube walls, either from tube side to shell side or vice versa. The fluids can be either liquids or gases on either the shell or the tube side. Inorder to transfer the heat efficiently, a large heat transfer area should be used, leading to the use of many tubes. In this way, waste heat can be put to use. This is an efficient way to conserve energy. Heat exchangers with only one phase (liquid or gas) on each side can be called one-phase or single-phase heat exchangers. 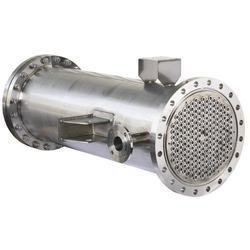 Two-phase heat exchangers can be used to heat a liquid to boil it into a gas (vapour), sometimes called boilers, or cool a vapour to condense it into a liquid (called condensers), with the phase change usually occurring on the shell side. Boilers in steam engine locomotives are typically large, usually cylindrically shaped shell and tube heat exchangers. In large power plants with steam driven turbines, shell and tube surface condensers are used to condensate the exhaust steam exiting the turbine into condensate water, which is recycled back to be turned into steam in the steam generator. We can design and fabricate a broad range of shell and tube heat exchanger to TEMA and ASME specification standards. 2 M², 2.5 M², 3M², 4M², 5M², 6M², 7M², 8M², 9M², 10M², 12M², 15M², 20M², 25M², 30M², 35M², 40M², 45 M², 50M², 55M², 60M², 65M², 70M², 75M², 80M². SS 316, SS 304 and MS.
Industrial heat exchangers consist of series of tubes. One set of these tubes contains the fluid that must be either heated or cooled. The second fluid runs over the tubes that are being heated or cooled so that it can either provide the heat or absorb the heat required. A set of tubes is called the tube bundle and can be made up of several types of tubes: plain, longitudinally finned, etc. Shell and tube heat exchangers are typically used for high-pressure applications (with pressures greater than 30 bar and temperatures greater than 260 °C).This is because the shell and tube heat exchangers are robust due to their shape. Several thermal design features must be considered when designing the tubes in the shell and tube heat exchangers: There can be many variations on the shell and tube design. The tubes may be straight or bent in the shape of a U, called U-tubes.